On June 27, 2012, I attended a JDRF Research Update meeting. I sent out a message on Facebook and Twitter about being there and that I was enjoying the updates. There were a handful of people who asked me to share what I was learning. So here we go! JDRF Cure Research – halting the autoimmune process and restoring normal insulin production. JDRF Treat Research – Developing new devices and therapies that optimize blood sugar control and treat or prevent T1D complications. JDRF Prevent Research – Preventing the autoimmune process from starting or stopping it before the onset of insulin dependence. And that wraps up the official news given at the research update. Simply reading all of this doesn’t really capture the excitement that was evident in the presenting speakers. I should also note that if you have questions on any of these updates, you should probably ask your local JDRF group for help. In this case, I’m just a messenger. Last weekend I attended a JDRF event called “Reach and Teach U” held in Bloomington, MN (one of the Twin Cities nearby suburbs) near the Mall of America. This was the third annual event, but it was the first I had heard of and attended. There was no charge (but pre-registration was required). It was scheduled to go from 8:00 AM – 2:30 PM, with a number of presentations and educational updates. They even had JDRF KidKamp for children ages 3+ (there was a magician and some other fun activities for the kids while parents and caregivers attended sessions). There were only a few exhibitor booths there, and in all honesty, it didn’t seem like there was much time to visit them anyway. Maybe it was just me, but I felt like I didn’t have much opportunity to check out the booths without missing one of the presentations. I felt very pressed for time. The opening keynote was incredible. Dr. Nat Strand, listed as “Amazing Race Winner, Type 1 Diabetic, Optimist” gave an energetic talk about her experiences navigating diabetes and winning (!!) the ‘Amazing Race’ (Season 17) on CBS. It was really something else. The adventure took her around the world in 23 days, and she had to pack everything she would need in a single backpack. She talked about working closely with her CDE who gave her great tips that helped immensely (such as removing some of her pump supplies from the bulky plastic packaging – sacrificing perfect sterility in order to save space). She said the producers and support staff were very ‘by the book’ and wouldn’t even hold a spare bottle of insulin for her. Nothing. The first thing the producers aired containing anything about her diabetes was a clip of her doing a blood test and it coming back at 337 mg/dl. She talked about how embarrassed she was – with that being her introduction to the world as a person living with diabetes and not being able to show a good number. But shortly after that episode aired, she started getting all sorts of letters and e-mails thanking her for showing real-life diabetes. Anybody with diabetes would probably have crazy blood sugars zipping around the world and enduring crazy stressful challenges and events! I got to sit with Leah, who was super excited about listening to Dr. Strand speak. After her presentation was done, Leah and I went to talk with her. Leah told Dr. Strand about how she was a big fan of the show, and was diagnosed with type 1 diabetes just before her season (17) started. Leah said it was a HUGE boost for her to watch Dr. Strand go out there, battling highs and lows, and doing all of these crazy things. It was very emotional, and I could tell it was a big deal for Leah to have this opportunity to talk with Dr. Strand and share her story. There were a few other sessions that were interesting that afternoon, everything from research updates to radical acceptance to diabetes service dogs. During lunch I was able to help convince my friend Cynthia to start her own blog, which was very exciting to me. I also ran into Dr. Robert Larson, the incredible pediatric endocrinologist who took care of me and my diabetes for twenty-some years as I was growing up (more to come with him soon!). A large portion of the lunch time was spent kicking off the 2012 JDRF Walk. Honestly, it felt kind of weird. Like “Oh, THAT’s why they are doing all of this stuff today…” Or maybe my expectations were just not in the right place. I think if it is a walk kickoff event, call it a walk kickoff event. Either way, it was a day well spent, and I would probably do it again. Lisa Finander was the guest speaker at the last ‘Adults With Type One‘ group. This was the second time I’ve heard Lisa present, and it was every bit as great as I remembered. She has lived with type 1 diabetes since 1969, which gives her a ton of street cred in my book. She said that diabetes has come a long way since then, which is great – but in some ways, many things are still the same, and many beliefs are still the same, which is disappointing. All of a sudden, your focus changes. You are no longer just trying to figure out life – now you have all of this extra stuff to learn. Nobody recognizes that. Nobody acknowledges that huge focus change. It’s an incredible disruption in life, and nobody talks about coping with it. That stuck with me – because she is right. Diabetes is intense. But we get so practiced, and do so many things over and over again, we lose sight of just how intense everything in our day really is. She told the story of an endocrinologist who was surprised to see a patients entire body relax once he delivered the results of an improved A1C test. He didn’t even realize how stressful it is for people to come in and see him — that’s something we think of as a no-brainer! Lisa talked about finding what she calls “healthy familiars”. These are things that foster your well being, that foster your health, and that you can reach for when you’re feeling stressed and/or overwhelmed. One of her favorites is a cup of green tea and a shawl. It helps her find a different feeling when she’s feeling bad. Rather than reaching for stuff that makes her feel guilty, she has, very purposefully, created these things that both comfort her and support her well being. I love that. But I think I’ll need to find something other than Diet Coke. Lisa is the author of a fun Disney book called ‘Disneystrology‘. It is not directly diabetes related, but she says it was the process of writing and assembling this book that really helped her find herself in regards to her life with diabetes. It was a pleasure listening to Lisa present again, and if you are ever given the chance to hear her present, I encourage you to make it happen. If you’d like information about any of the local support groups I attend here in the Twin Cities metro area, let me know and I’ll fill you in. The JDRF volunteers around the Minneapolis area are very active. I’m lucky to live here so I can participate in some of the great things they are doing. My trip to Capitol Hill early in the year helped me get to know some of the people in the Grassroots Advocacy team, and since then we’ve worked to keep the relationships going and the advocacy efforts moving. Monday is a great example. A group of about 12-13 of us met with our district congressman, Erik Paulsen. This time of year the JDRF Promise Campaign swings into full steam. The idea behind this is to get local families and those living with type 1 diabetes to tell their story to their local representative, and ask them to “remember me” when they are on Capitol Hill making decisions that will affect us. The JDRF Advocacy group does a great job of organizing “asks”. That is, what are we to ask for while we are there? This provides a consistent set of high level pushes coming from as many of the congressmen and representatives that we can get on board. We did our best to intermingle these asks into our personal stories, and the truth is that they actually fit very well there. We spent about a half-hour visiting with Congressman Paulsen, and it was clear to me that he was interested in doing whatever he could to help. He gave each of us his undivided attention, and asked some great questions. We talked about the continued support of funding to the NIH and FDA, and lobbying the FDA to keep things moving with the artificial pancreas. We talked about concerns over healthcare, and how many of the parents were terrified about satisfactory coverage. We talked about the financial burdens of life with type 1 diabetes, and the scary instances of those we’ve lost. My impressions when it was all said and done? He gets it. He gets it and will do all that he can to help (within the political and logistical limits he’s bound to). The world is not going to change as a result of one meeting, a few meetings, or even a hundred meetings. But as we continue to push for better, and develop relationships where possible, they will remember us as they are on The Hill battling out budget cuts and voting on proposals. That is why “Promise To Remember Me” is important. As a normal, average, everyday Scott, living life with type 1 diabetes – was it much to ask for me to volunteer a couple hours of my afternoon? Not at all. As someone who is totally politically ignorant, was it intimidating to do? Absolutely. But you know what, it was easy. It was all about telling my story about life with type 1 diabetes. That’s it. One person to another. Do not be afraid to get involved. If I can do it, anyone can. The local DOC Contingent sure pulled together while we were in D.C. for JDRF Government Day. What started out as a group of nine or ten quickly turned into sixteen or more! Every time I checked my e-mail or twitter feed, there was another person who caught wind of our plans and wanted to join in. I had no idea so many of these folks lived close enough to meet us for dinner! Chris and Dayle helped out BIG TIME in choosing a place to go and making (constantly changing) arrangements. We went to a place called Chevy’s, which was right across the street from where our hotel shuttle dropped us off and would pick us up later. I finally got to meet Miriam Tucker (I’m a huge fan). I got to see Allison again (we share a strong “no drama” vibe). I met Sarah (any friend of Kim‘s is a friend of mine). I met Lindsay (who totally shares a brain with Kerri, what’s not to love? ), And possibly the highlight of my trip? Getting to meet KEVIN (I am terribly jealous of his awesome beard)!! I need to talk about Kevin for a minute. Kevin has been “off the grid” for more than two years. His blog, parenthetic (diabetic), is best described as a dormant volcano. Tons of raw power that you have to respect – never knowing when it might erupt into life and start spewing top-notch blog posts again. Even being absent for so long, when I introduced him to others around the table, four out of five knew of his blog and the great stories it holds. Plus – he bikes everywhere! I mean every. Where. In fact, for dinner, his bicycle was locked up to a post just outside the window. I wanted to invite it in to sit with us! Heck – I bet Kevin could have sat on his bike, balancing no-handed, the whole time. A beer in one hand, and a tortilla chip in the other – with his helmet and bike jacket balanced on his lap. I don’t know. I just think people who bike when it’s cold out are badass. That, and his beard is awesome. So many friends, so many laughs. Plenty of Diet Sodapop. Chris even managed to work some magic that allowed us to stay in the restaurant well past closing hour! It was the perfect way to spend an evening. The first session I went to was called “Government Relations 101”. Sounded perfect to me – as I had no clue what I was getting into. Kim and I sat next to each other and listened to a great, high level, presentation about the JDRF and Government Relations. At some point during the talk, Gary Hall Jr. was mentioned. Yeah, 10 time Olympic Medalist Gary Hall Jr.! Everyone looked over to the left, and there he was – sitting but a row in front and a couple of seats over from us! After the session was over, Kim and I went to chat with him. He was so down to earth, and there advocating just like the rest of us. He wasn’t big bad superstar Gary – he was just Gary, a guy with type 1 diabetes doing whatever he could to help make a difference. By the time that session was over, it was around 5:00 PM on day 1. I had only slept about tw0 or three hours before leaving Minneapolis, and the short sleep was really starting to mess with my blood sugars. Even though I had been throwing bunches of insulin at my highs, they just wouldn’t budge. Until all of a sudden they did–scared the crap out of me–then went back to being high again. I have a theory about the lack of sleep and my blood sugars running high. When I don’t get enough sleep, my body is stressed out trying to keep up with my activities – so it’s likely pumping out all kinds of stuff that make me more insulin resistant than normal. That’s my story, and I’m sticking with it until I learn differently. The next morning started off way too early, again, but I was quickly drawn into the action. We were in a huge ballroom lined with tables. There must have been at least 150 of us in there. Each and every person took a minute to stand up with a microphone and share their story about why they were there. It was pretty damn moving. Lots of laughs, and twice as many tears. Later that afternoon was the blogger round table discussion. There were two groups presenting, splitting the audience into two equal-sized groups to make open discussion a bit easier. I presented with Kelly Kunik, Kim Vlasnik, Kerri Sparling, and Cherise Shockley. The other group was Scott Strange, Allison Blass, Mike Hoskins, and Kelly Rawlings. They did a live broadcast of our group on UStream (recording below), allowing many more people to tune in. With all of the questions, both from the people in attendance and from people watching the broadcast, we could have used the entire afternoon. It was too bad we couldn’t get to all of them. I would also love to see a recording of the other group – rumor is that it was recorded and will be online soon. After the roundtable session, Kerri and I were asked to help introduce a new tool the JDRF has made available. Type 1 Talk is a brand new Facebook app that allows you to connect with other people touched by type 1 diabetes who are nearby. You can use this tool to see if there are any local groups nearby or to organize a get together for coffee with like-minded people. You’ll hear more about this soon, as I think the JDRF folks are pretty excited about it. Aside from being introduced as “Steve” (it’s Ok Lorraine – I forgive you, but will not pass up an opportunity to poke fun in a blog post…), it was a pleasure to share the stage with Kerri again. In the evening we had dinner and listened to a speech by Jeffrey Brewer, President & CEO of JDRF. I had a front row seat and was excited to get a feel for Mr. Brewer. In short, I felt his initial presentation was a little too “canned” or scripted. But I think if he would have slowed his delivery down just a little, it would have been fine. He was much more relaxed in the Q&A section of the dinner, and that allowed his passion and personality to shine through. He gets it. He talked about his feeling that many of us adults have fallen away from the organization because we’re not being shown all of the good work the JDRF is doing en route to a cure. We hear “cure, cure, cure”, but as we all know, there isn’t one yet. So we feel as if there’s nothing happening, that it’s the same old messages over and over again, then we move on, sometimes with (in my opinion) hostility towards the JDRF. Mr. Brewer wants to welcome willing adults with type 1 back into the fold. He wants to do a better job of including us in things they are doing, and he wants to do a better job of sharing all of the great things the JDRF is doing as it is working towards a cure. For example, did you know that the JDRF spent $10 Million dollars to fund a study on CGM use? It was a study that might have been viewed as a common sense thing – of course, CGM use should improve diabetes management, right? But there were no studies done to prove it, so insurance companies were not covering CGM devices as widely as many thought they should. JDRF stepped up to the plate to fund this study, which provided data which was then used to push for better insurance coverage for CGM devices. That was $10 Million dollars that nobody else would spend because it seemed like such a no-brainer! Why fund a study that most would call common sense? 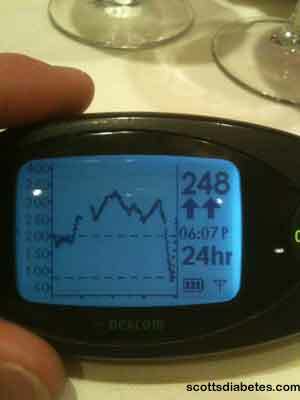 I thank the JDRF for the insurance coverage I have for my CGM sensors. If they had not funded that study, who knows where we would be with CGM devices and insurance coverage. Take that example a step further – do you know of any CGM systems that are labeled and approved for use by children? As far as I know, as of today, there are NONE approved for those under the age of 18. How dare we adults feel like the JDRF isn’t doing anything for us? Later that night, five of us d-bloggers made history. A live, sweatabetes workout session at 11:00 PM! It was pretty awesome! I taught everyone how to do a Turkish-GetUp. Ginger would have been so proud! After about 40 minutes of working out, many of our blood-sugars were dropping. So we made a group decision to head downstairs and have ice-cream, where we met up with the rest of the slackers and made them feel really bad about not working out. After ice cream, I was coerced into demonstrating a Turkish-GetUp for those that missed the live sweatabetes session. So I did one. Using a jar of glucose tabs instead of a weight. On the floor of the bar. I know, crazy right? It’s all Ginger’s fault. Did you know there is a whole section of JDRF that deals with Government Relations? Me either – at least not until this trip. When I think JDRF, I always think about fundraising and walks, stuff like that. I didn’t think about people keeping an eye on government stuff. It makes sense though, if you think about it. There are many decisions made on Capitol Hill that directly impact us, positively or negatively, in our daily lives with type 1 diabetes. As I learned more about the many things the JDRF is, and has been, involved in, I was impressed by the scope of their vision. Beyond government relations, the JDRF is actively involved with the NIH (and many others), together funding a number of important studies. We listened to a great presentation given by Judith E. Fradkin, M.D., Director of Diabetes, NIDDK, NIH (that’s a mouthful!) and Richard Insel, M.D., Cheif Scientific Officer, JDRF, about some of the active partnerships and how the NIH & JDRF research is making progress at all stages of type 1 diabetes (preventing onset of autoimmunity, stopping active autoimmune attack, preserving beta cells, improving glucose control, restoring beta cell function, and dealing with complications). JDRF and NIH Research: How Does the Microbiome Confer Immunoregulation and Alter T1D Susceptibility? I found an old report on the NIH website from back in 2005 and a new video with Dr. Judy Fradkin from the NIH that was taken at this years JDRF Government Day event. They are totally unrelated to each other, but does show that NIH & JDRF were working closely together back in 2005, and they are still working closely together today. You can tell from her video, Dr. Fradkin (who still sees patients, by the way) is excited and engaged with us. After spending two days learning about some of what the JDRF is doing, who they are working with, and what the messages for our representatives were, we went out to our representative’s offices to ask for their support. I got to hang out with the group from Minnesota, and watch them in action. They were a blast to be with, and once we got into those representative’s offices, they handled their business – on behalf of all of us living with diabetes. I don’t think us average folk out here appreciate the gravity of some of the things being advocated for. For example, what do you think will happen if the FDA’s budget is cut? We already think they are slow, right? Imagine if they had less people and fewer resources? Wouldn’t that slow things down even more? These things all feel so far away from us, and they are, I guess. But it doesn’t take long for some of these decisions to affect our lives. We didn’t get to meet with any actual members on The Hill. We met with aids from different areas of their offices. While I was very impressed with them in general, most of them didn’t know the first thing about life with diabetes. It’s terrifying to think about the power of a signature when they are so disconnected from what we deal with on a daily basis. With that in mind, it is our job to educate them and let them know where we need their support, and how a decision will help or hurt us. I do not enjoy government stuff. While the atmosphere around all of the old buildings is pretty cool, I found the inside of the two buildings I saw to be very boring and sort of sterile. If it weren’t for the company of the Minnesota JDRF gals, I wouldn’t have enjoyed it much at all. But stepping back from the event a bit, this work is necessary. Critical even. These politicians are a different breed to me, and it’s weird to watch them be interested in what we have to say – but only because it’s their job. I think about how many different groups come in each day to pitch their story, and whether any of these people think about us after their work day is over. Did we make an impression? Or were we just another group of activists? Of the four days I spent in D.C., two of them were a lot of fun, and two of them were a lot of work. The fun days were listening to the presentations, learning about everything that the JDRF is involved in, and getting to know some of the other volunteers who work so hard for us. The not-so-fun days were the two days spent on The Hill. They were exhausting, and not much fun at all (except for hanging out with the MN gals). We ran from meeting to meeting to meeting, with lots of waiting in between. These trips are hard for me, taking time away from my family, not being able to work on stuff that actually helps pay the rent, and dealing with out-of-pocket expenses that, while often reimbursed, still have to come out of the “rent and groceries fund” for a while. But if I have the pleasure of being invited back again next year, I will enjoy the two days of fun, and proudly sacrifice two days on The Hill to help educate and advocate. **Disclosure: JDRF paid for my food, travel, and lodging. They did not place any expectations or restrictions on my writing about the trip, and have no editorial control of what I write about it. A quick, post-trip vlog post that I recorded last night after getting home from the airport. I know that I look half asleep already, and I’m probably even slurring my words a little bit… but I wanted to get a quick “thank you” out to the JDRF and everyone else I met these past few days. More to come after I get caught up on my rest!